Enoch L. Johnson - better known as "Nucky Johnson" and called "Nucky Thompson" in the "Boardwalk Empire" series - was born in 1883. When Nucky was a baby, Atlantic City had already been transformed from an offshore island, plagued by mosquitoes and greenhead flies, into a Boardwalk-dominated resort town. During the early 20th Century, Atlantic City's Boardwalk was extremely popular - especially on Easter Sundays (when people, showing-off their spring finery, literally mobbed the place). 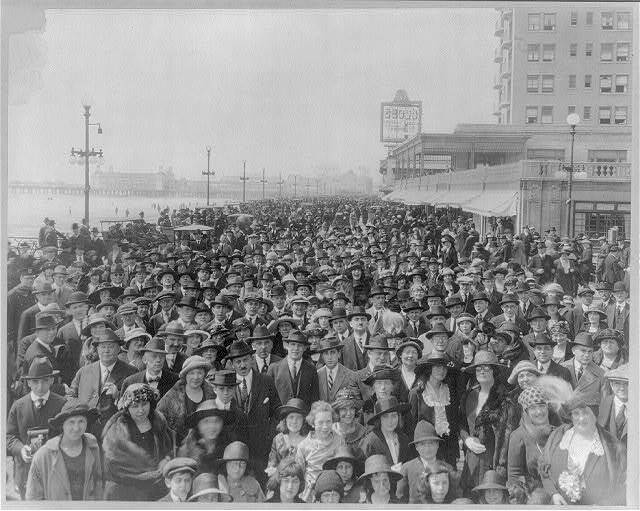 A photograph, taken on an Easter Sunday in 1905, reveals what it was like to be part of the Boardwalk's crush of wall-to-wall people. During Prohibition - when the U.S. Congress outlawed the making, selling, transporting and consuming of alcoholic beverages - people in Atlantic City routinely disregarded the law. To use the words of U.S. Treasury agents, Nucky Johnson became "the virtual dictator" of Atlantic City because he protected those engaged in the business of (among other things) illegal, intoxicating liquor. And what a good business it was. Although agents of the federal government tried to enforce Prohibition, people who wanted a glass (or more) of liquor routinely found ways to disregard the law. Atlantic City was in a prime location to receive alcoholic beverages which were shipped from Canada and Scotland. One of the people with whom Nucky did business was Arnold ("A.R.") Rothstein. 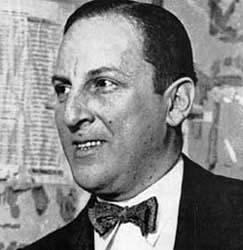 Notorious for many reasons, including allegedly "fixing" the outcome of the 1919 World Series, Rothstein - also known as "The Brain" - was the inspiration for Meyer Wolfsheim (a character created by F. Scott Fitzgerald in The Great Gatsby). The Treasury agents quickly realized that local law enforcement "not only were well aware of these conditions but actively regulated, protected and at times even assisted these rackets" and that this fact was "well known" to the public, who "understood" that the racketeers were paying for protection. People will sometimes do, in other words, what people want to do - even when the law requires otherwise. Nucky Johnson, who was the boss of Atlantic City for thirty years, built an empire based on that fact. And ... as long as Prohibition was in force ... his wealth continued to grow. What happened to Nucky? Was the finale of "Boardwalk Empire" true to life? Click the first link below to learn "The Rest of the Story." Hint: There's a big difference between what we saw and what he was. Music - "I Never Knew I Had a Wonderful Wife Until the Town Went Dry"
Image of Enoch L. ("Nucky") Johnson, online courtesy U.S. National Archives and the Atlantic County Historical Society. Quoted passages from The Last Good Time, by Jonathan Van Meter, online courtesy Google Books. Bos, Carole "Enoch L. ("Nucky") Johnson - Nucky Thompson" AwesomeStories.com. Oct 07, 2013. Apr 18, 2019.